When you come to home decoration, a creative and functional furniture can beautify your entire home. Furthermore, what is the best moment when your relatives and friends compliment for your furniture (not you). 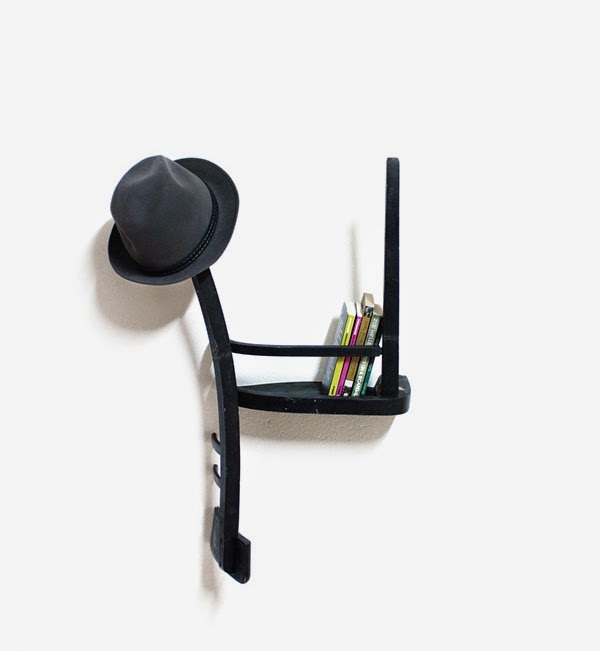 Spanish designer Tess Hill transforms a wooden chairs into clothes hanger with shelf by simply cutting it in half, flipping and hanging it on the wall. Multiplo Versatile and modular furniture concept are best suited for any home which can be used as the bed, table, sitting room and much more in some easy moves. 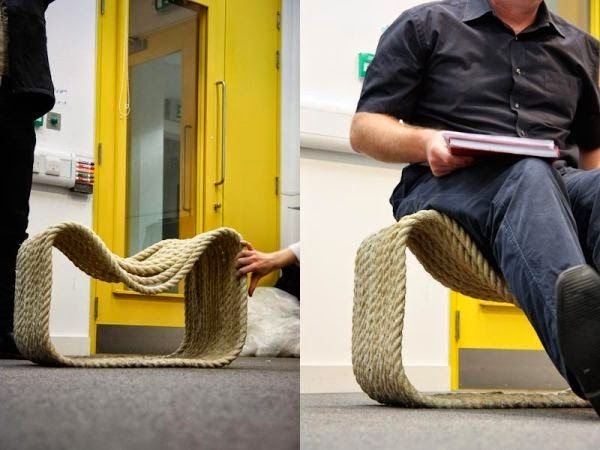 Ropey chair by designer Jon Fraser is made from 80 metres of sisal rope soaked in polyurethane resin and cured into 20 unique profiles, creates a smoothly contoured surface. K Workstation incorporates Bamboo laminated plywood for creating efficient space managing working space. 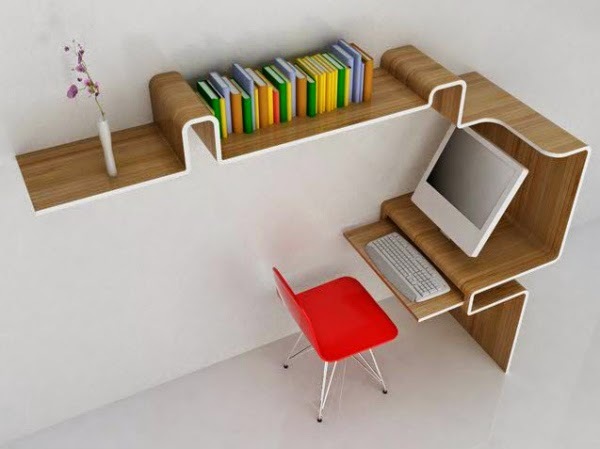 The folding curved shape creates shelving and desk space within one working unit. 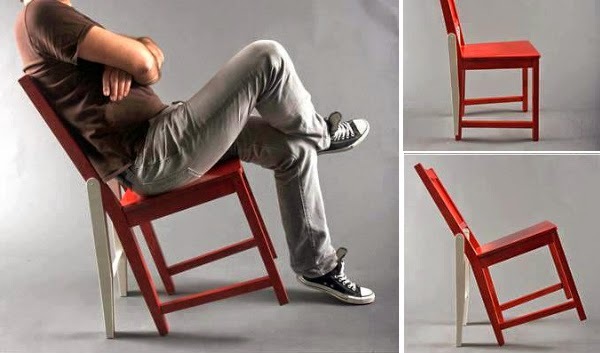 This chair is a regular chair when you are in the normal position and when you need, it can provide you with an additional support. 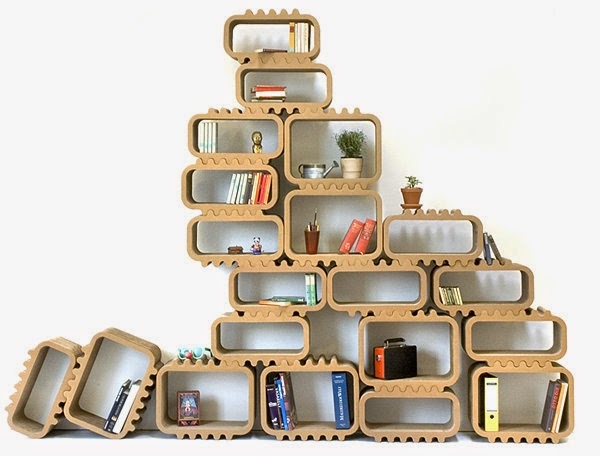 This temporary DIY modular shelving system from Diefabrik utilizes the power of interlocking shapes, which helps hold these contemporary shelves in place. Create your own design, then fill it with books, plants and other curiosities. 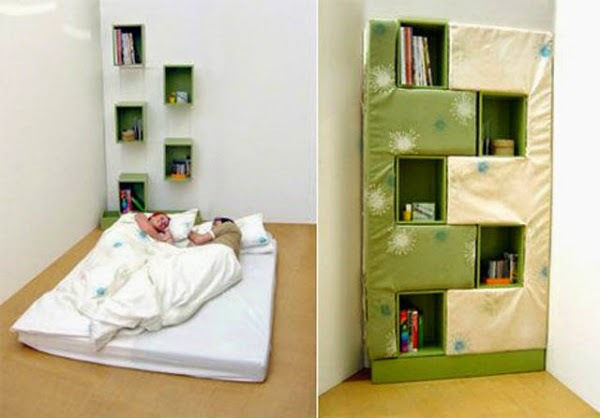 A mattress stands upright in four bits and forms the bulk of the bookcase. These surround five storage shelves which are suspended in mid-air by a wall mounted frame. The mattress sections are placed on the floor and slot together to form the bed – with two parts for a single, or all four to make a double. 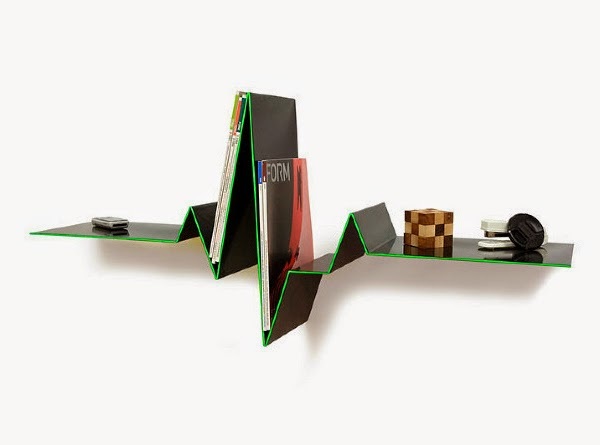 Pulseline bookshelf takes the shape of well known heartbeat. The shelf works both as wall art and as an object to display some magazines and smaller items you like. The edge is painted with a florescent paint that glows in UV light to emphasize the silhouette. 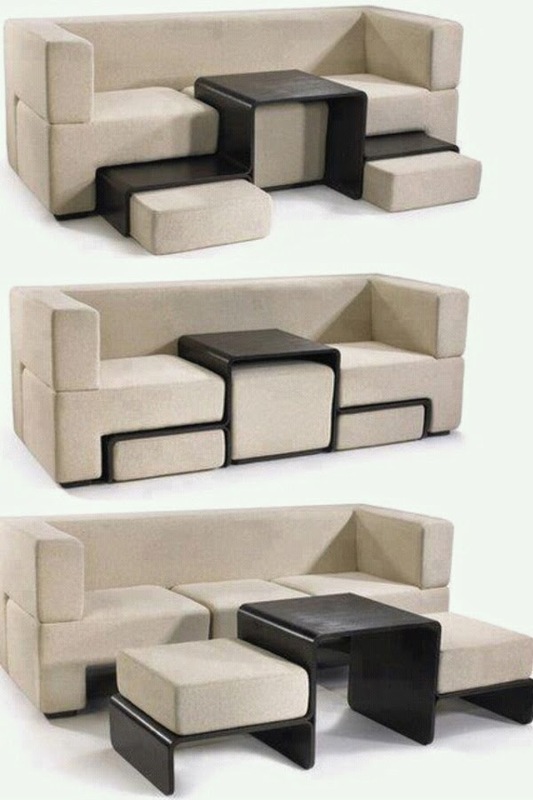 Climbing sofa is designed by Lila Lang. 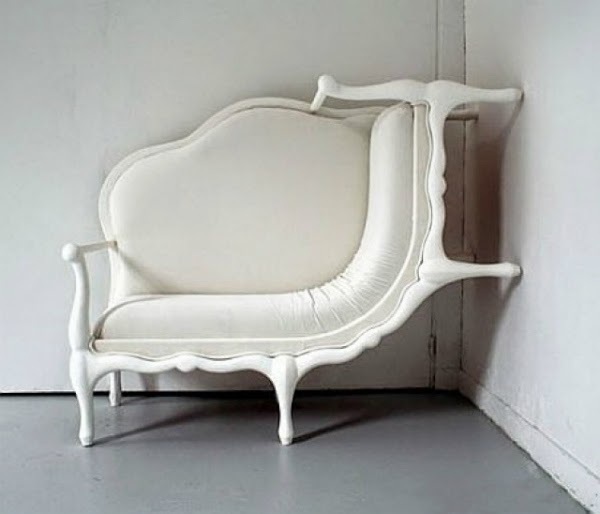 The uniqueness of this sofa is one half is a plain looking with a decidedly curvy old fashioned style and the other half appears to be climbing the wall! 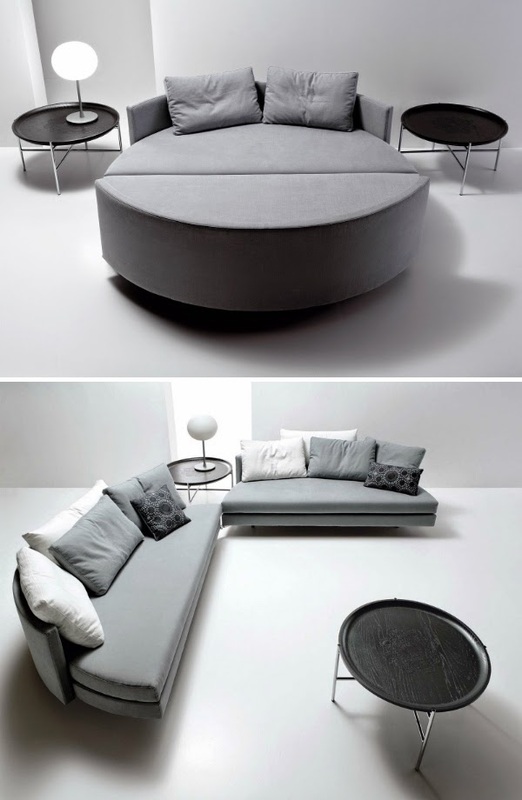 This is an awesome sofa idea with hidden space for a table and two additional chairs. Basically its a normal sofa with a table in the middle. When you pull the table, you will get a side table, two more sitting arrangements and another sitting space in the sofa. 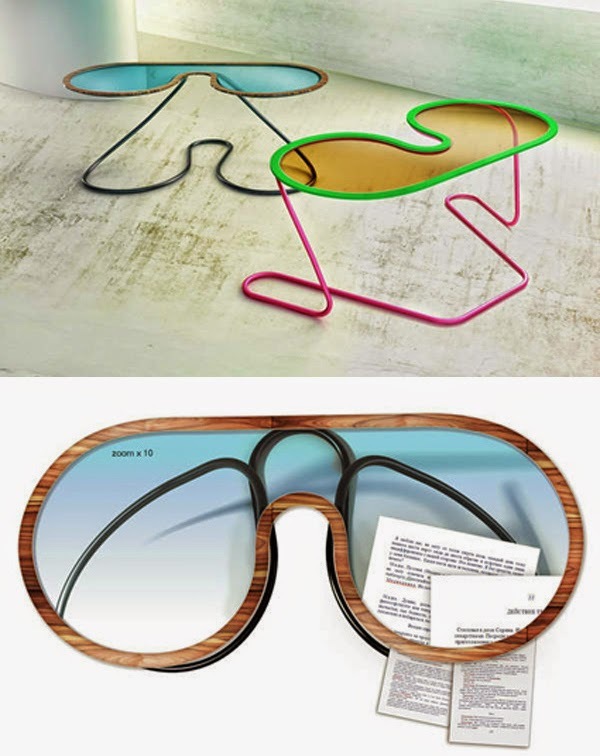 Clever design with space saving technique. 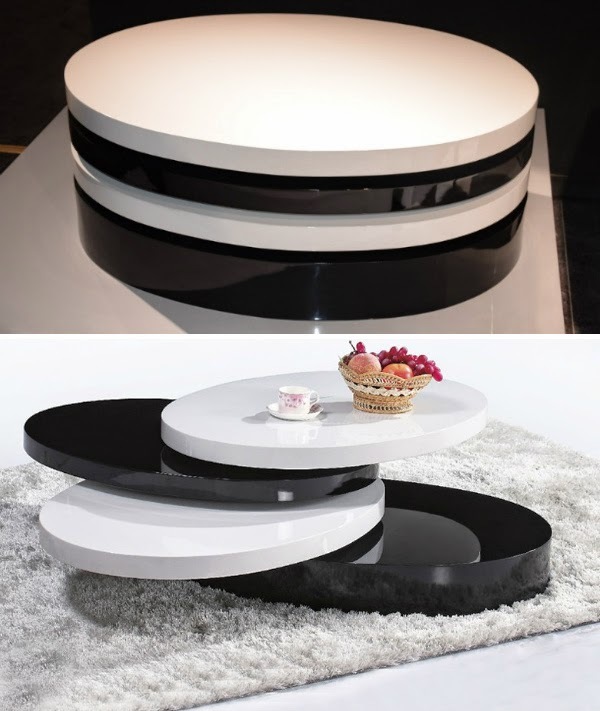 This is a modern living room table comes with four layers which can be rotated and adjusted according to the need. 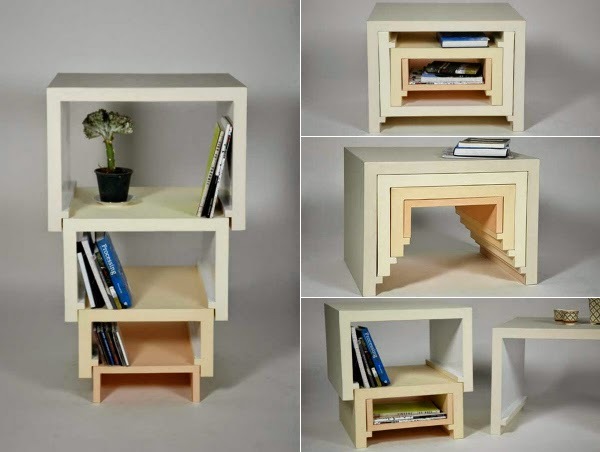 This Stacking Nesting Furniture can be utilized as a table or shelf. Depending on your personal needs, you may stack them up into a top-heavy tower, lay them out separately as table and chair, or pack them up for storage. 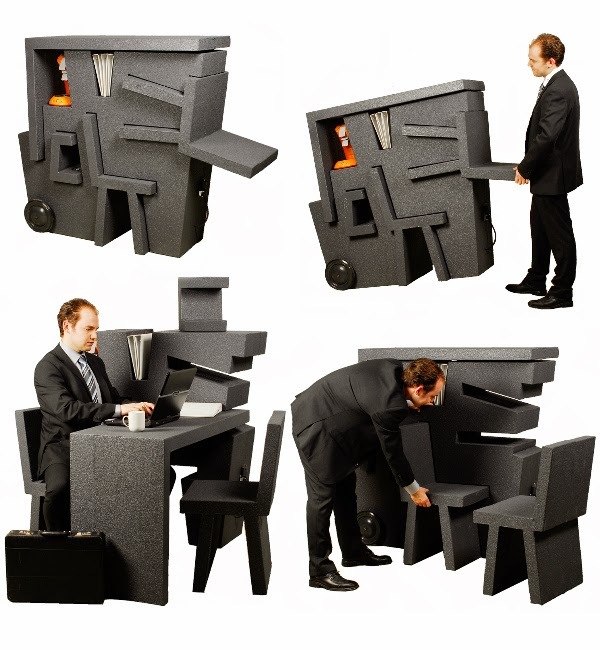 Constructed out of lightweight EPS foam, the office comes with two chairs, a table, built-in lights, power strips, and bookshelves. 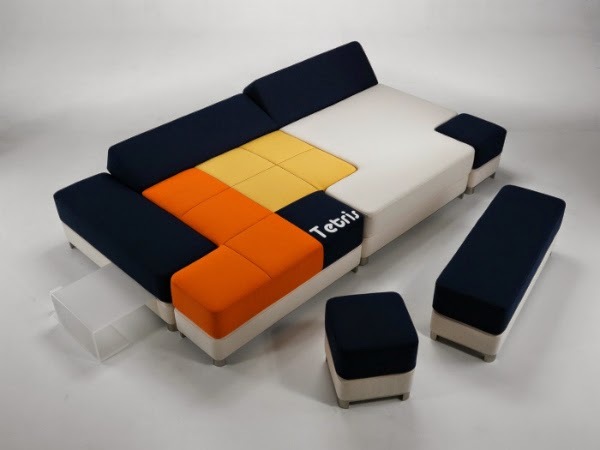 If you know how to play the game ‘Tetris’, this couch will take you to a new extreme with this stylish, functional, re-arrangeable sofa that teases the instincts of the arcade game fan in all of us. The two elements that compose the project are bound with a peculiar steel zip and provided with a fastening system for the bed configuration. The union of the two sofas is intuitive since one of the two elements is provided with small wheels that allows you to rotate the movable module towards the fixed one easily. 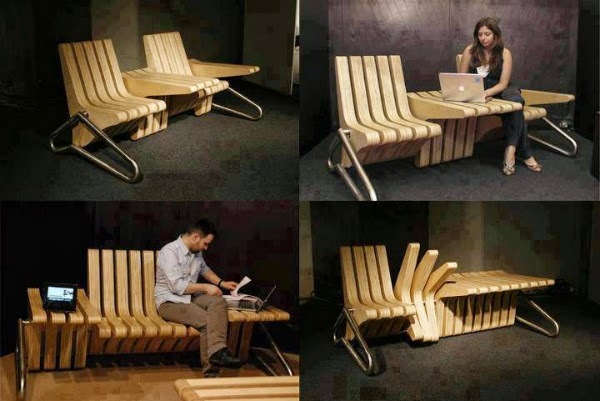 Coffee Bench is a furniture system with adjustable seat and table space within. Space of seat an table is adjusted by rotating elements of the bench. 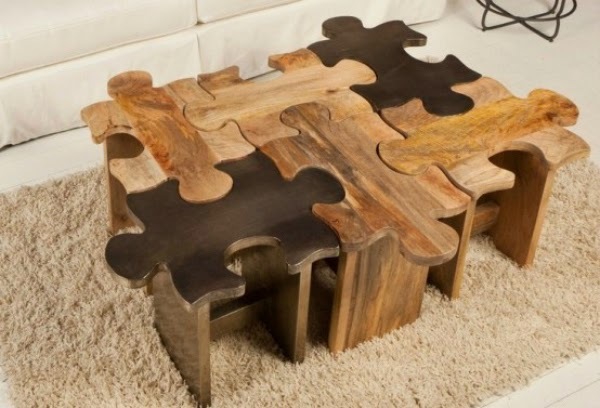 Another creative wooden table which has six pieces of puzzles. Each piece is a stool or individual small chair when separated. 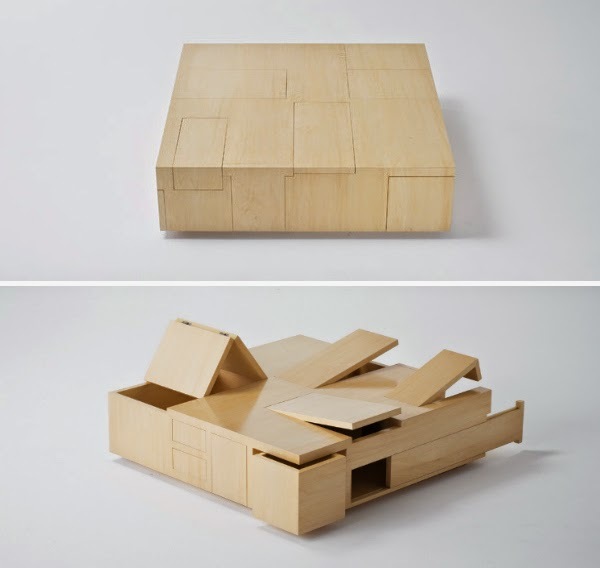 The “Kai Table” has many hidden storage components can be used to store money, documents, jewelry, and other valuable possessions in different different components. 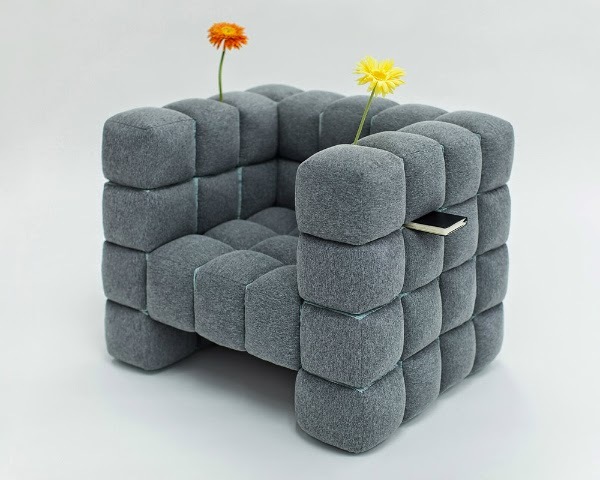 Lost in Sofa chair allows you to store and hide small objects between the cushions. Things often get lost under the sofa. It is ordinary for a coin or a TV remote to be accidentally found in between/underneath the sofa cushions. In personally, I like no. 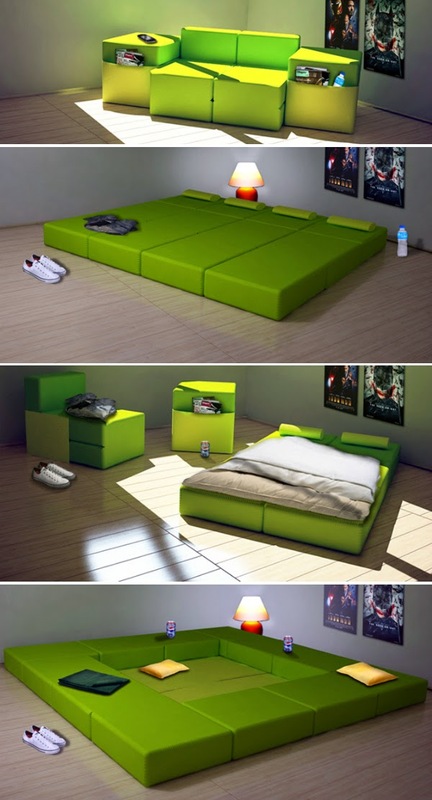 14 which is Tetris Couch, its look so awesome. I can just change the pattern of the couch everyday. So which one you like the most? Comment below to share your favorite furniture with us!